Landmark South Shore Bridge- Gone! Dynamite: The Aetna Story with four new pages. Early Gun Clubs of Northwest Indiana. "The Voice of the Steel City" - The Story of Miss Frances Kennedy. Miller, which was annexed by Gary by common council ordinance on February 17, 1919, signed by the mayor on the 20th. Miller is older than Gary, which was founded in 1906. Situated at the south end of Lake Michigan, the land is former lake bottom with sandy soil and an abundance of wetlands. Teeming with fish, wildlife and berries, it was a popular hunting and food gathering area for the Indians. Miller's history began in 1851 when a train stop, eventually called "Miller's Station", was constructed by a predecessor of Lake Shore and Michigan Southern Railroad. It has been long held that Miller got its name from someone named Miller, since the oldest stone in the cemetery is that of John S. Miller, age 3 and is dated 1851. More about that on the How Miller Got its Name page. The railroad timetables identify the stop as "Millers" but the U.S. Postal Service named the post office "Miller's Station" in 1865 when the station was established. It was shortened to "Miller" at one time, but for one five year period was named "Vanderbilt" by the Post Office. For many years Miller remained an unpopulated, out of the way railroad junction surrounded by swampy terrain hardly suited for farming. The first inhabitants were often fishermen, squatters along the beach who made their living fishing and selling berries that grew wild in the dunes. The Carr family was prominent among these people for many years, not only claiming claiming ownership of a lot of the beach until 1930, but developing early tourism in the area. Swedish immigrants, many fleeing Chicago after The Great Fire, moved to the area in the early 1870's. They founded a church, eventually building a frame church in 1894 that still stands today on Lake Street. The most important experiments in aeronautics prior to the the Wright brothers invention of the airplane were conducted on the beaches of Miller and just to the east of Miller. Octave Chanute, the elder statesman of aeronautics at the time, performed glider experiments on the beach which developed the basic bi-plane design which was adopted by the Wright brothers. In the early 1900's the desolate dunes and broad beaches along Lake Michigan were a primary attraction to many. Our most famous 'hermit' - "Diana of the Dunes" - was actually a well educated, if somewhat romantic, University of Chicago graduate who rebelled against the competitive, materialistic world of bustling Chicago and in 1915 fled to the dunes with nothing but a knife, spoon, blanket, jelly glass and two guns, becoming a local legend. Miller's unique terrain and proximity to Chicago continued to be a draw for people wanting to get away from the city and enjoy lake breezes. In the 1920's the Marquette Park Pavilion and the Bathhouse were built. Small cabins began to appear in the dunes east of the Park. After World War II many year-round homes were built and today the attraction continues as many choose Miller as their primary residence or as a location for a summer home. 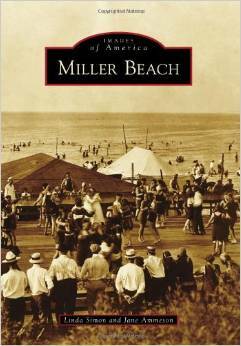 Of special note is the marvelous Miller Beach book done by Linda Simon and Jane Ammeson. Make sure you check out the Miller Historical Society's website.